Chia seeds are loaded with nutrients and are truly among the healthiest foods on the planet. With that said, I try to find ways to slip these cute little baby seeds into everything I can. My yogurt is no exception. Lemons- well if you read my post about detox water, you get a glimpse into my passion for lemons. They are amazing. Raspberries- my favorite fruit ever and oh so good for you. Honey- boosts immunity, fights bacteria, helps boost energy, etc... it's my go-to sugar replacement. So what inspired this recipe? "GREEK YOGURT WITH REAL FRUIT & CHIA!" It had super cool, trendy font and everything. "O0O0o Chia in yogurt!" Must be legit right? Ehhhhh not so fast. Before you toss the 5 for $10 into your basket, take a peak at the back like I did. I don't know about you, but I like to keep my yogurt as clean as possible AKA free from unnecessary crap. This recipe in particular is naturally sweetened and flavored with honey, lemon and raspberries. It will make you feel like you're cheating on your diet- I'm even putting this in the "dessert" category of my blog. It's seriously mind blowing-bowl licking-round 3-deliciously good .... and did I mention healthy? So good I may have to sell this. What should I name it? Yogi Yogurt? How cute is that!? 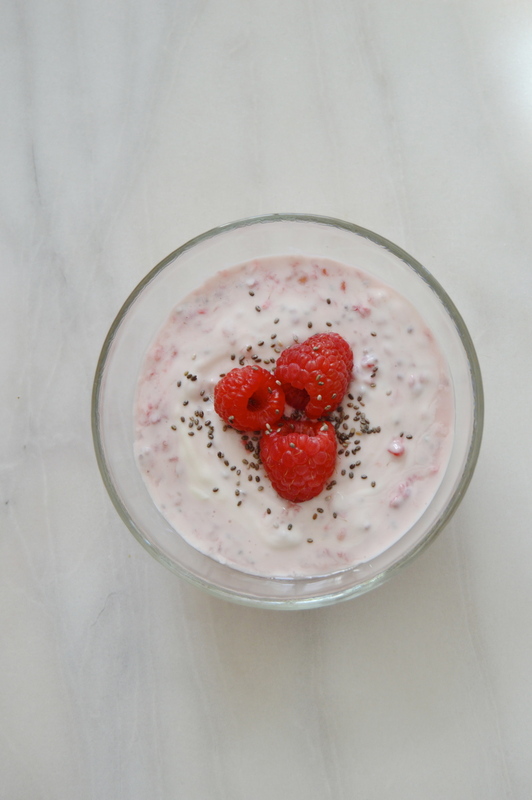 You'll never go back to plain yogurt again. Mash about10 raspberries with a fork. ...and just like that your yogurt will never be the same. Freeze your magical yogurt concoction. Once frozen, plop it all into your Vitamix or other high performance blender. You now have yourself some darn good frozen yogurt. What's your favorite greek yogurt brand?? I'm always on the lookout for new ones with low sugar!